Dechko Hristov Uzunov was born on February 22, 1899, in the town of Kazanluk. He spent a year studying at the Munich Art Academy (1922-23) and in 1924 he graduated from the Sofia Art Academy, major Painting. Dechko Uzinov was later Rector of the Sofia Art Academy, Director of the National Art Gallery in Sofia, and several times Chairman of the BG Artists Union. Art Professor and Academician. Chairman of the UNESCO International Plastic Arts Association, Honoraray Member of the Moscow Art Academy. Member of the European Academy of Sciences, Art and Literature. Dechko Uzinov had been awarded numerous times for his outstanding art works. 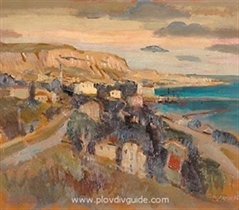 He was one of the most eminent BG artists, who left a large artistic heritage of over 13,000 paintings. He worked in most of the genres but predominantly portraits, figural compositions and landscapes. Dechko Uzunov died on April 26th, 1986, in Sofia.